Written by Patrick McCrann, Endurance Nation founder and 22-time IRONMAN finisher Whether you’re new to triathlon, or a seasoned veteran, you fully understand the true cost of our sport: time and money. 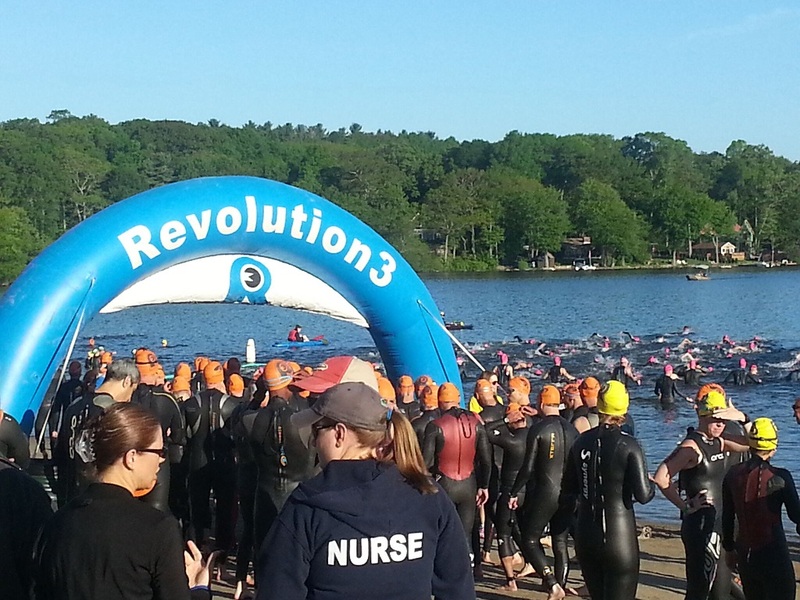 As the sport of triathlon has evolved over the past 20 years, it has gotten increasingly more complex and specialized. While it might seem like everyone on race day takes triathlon very seriously, that’s not a prerequisite for success. In this article were are going to explain to you five critical areas that you can focus on to maximize your training time and retain your triathlon dollar. As a beginner, when you go to a race it is probably difficult to figure out who is doing this for fun and who is doing this professionally. As background, Endurance Nation has been around for over a decade. We’ve had more than 1,000 Ironman® finishes a year, every year, since 2010. We are the Ironman® Division I World Champions for three years in a row. Translation — we have worked with countless athletes to help them refine the training schedules and improve the results within the framework of their existing lives. This is no small task, but we learned quite a few things along the way which I want to share with you. Remember the thing we said before about complexity? Introducing a coach into your system dramatically increases the complexity of your triathlon experience. The coach is going to have a bias around how you want to train. Your coach is going to introduce many different types of workouts that require you to change your schedule frequently. You become dependent upon a coach for those workouts. Will they be here on time? Are they different than last week? Is Coach going to answer my email? My text? We have consistently found that the most successful triathletes are also the most self-sufficient. Do yourself a favor and start things off on the right foot by taking charge of your training and racing. 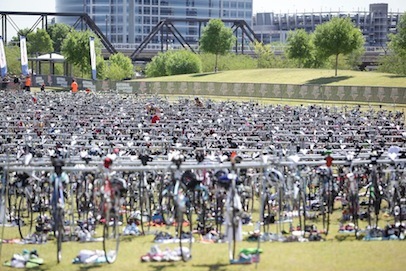 Humans are incredibly social creatures and triathlon is no exception. We are very adept at following the lead of others – from clothing to training to cars to dogs…you get the idea. Do yourself a favor and find a local triathlon club. This will be a great place for you to learn a ton about the sport and to stay connected with others as you progress down the experience road. This group will have workouts, social events, learning events, and so on. They might even have discounts available at local stores, or can recommend you to local professionals if you need help in a certain area (injury anyone?). Just as importantly, training with others will help keep you motivated and hold you accountable. It’s really hard to snooze the alarm when you know there could be ten people waiting for you at the pool that morning. Think of a social group as using a carrot to motivate you, where is hiring a coach is more like using a stick. Back in the day, there were very few resources on triathlon training. It was honestly hard to find out how to prepare. Today there are millions of articles countless resources and very little of it is coherent or makes sense. So where should you begin? The most important thing that you could do as a triathlete is to define a week of training that works with your schedule. It might be fantastic to swim one hour before you get on the bike for a three-hour ride. But if that workout doesn’t fit into your life without causing major friction — it’s just not worth it. Getting in your training in is a constant balance – not battle – between what you want to do and what you need to do. If you start out by making the training fit, then you have effectively eliminated that friction. You can do this by sitting down and taking a look at your week. Where can you carve out approximately an hour a day to do your training. For many of us, the early morning is the easiest time to do this before work. Life has a way of getting away by the end of the day between extra work, meetings, traffic, kids, activities, and so on. Stack the deck in your favor by focusing on an earlier bedtime with an earlier wake time to get those sessions done before the world wakes up and gets crazy. In the same way, we recommend you structure your bigger training sessions on the weekends when there is more time. If you have a long-run in the program or a long ride- put those on Saturday and Sunday. It doesn’t matter which one goes on which day — both options are better than trying to squeeze those sessions into your existing Monday through Friday schedule. 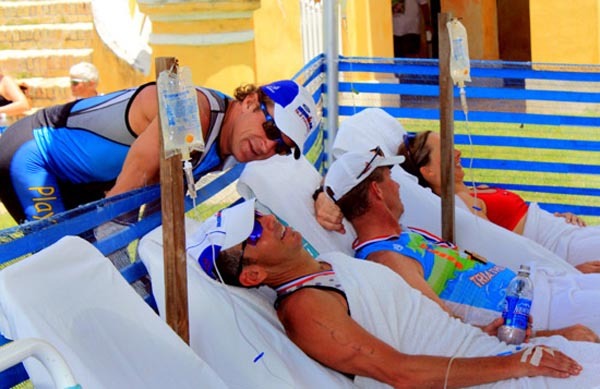 Most Age Group triathletes create time for training by reducing their sleep. This is a critical mistake that can lead to undue fatigue, and even injury or illness. Do your best to stay as close to 42 to 45 hours of sleep a week. Our final training tip for you is to make sure that you have at least one day of rest the week. For most triathletes, this is the hardest session to schedule. If I’m not working out – I must be going backwards – is the usual train of thought. This couldn’t be further from the truth. Every workout, even every week, requires a window of recovery. During this time your body is processing the work that you’ve done and giving you space to get stronger. For example, if we just did a massive squat workout at the gym with tons of weight, chances are you and I are exhausted. When we walk out of the gym (or stumble! ), we are probably the weakest two people within a 250-mile radius! Give us a day to recover and we’ll come back stronger. Don’t allow for recovery? All of your workouts for the remainder of that week will suffer… so plan accordingly. Inside Endurance Nation we spend the vast majority of our time creating resources and opportunities for athletes to learn. It’s not a mistake that the fastest athletes you know are also some of the smartest. Not necessarily book smart, but they know their body, they know their limits, and they figure out a way to make the most of what they have. Get Your Lead On: It’s very easy to fire up your smart phone and find hundreds, if not thousands, of articles on travel and training. Be specific in your search terms or pay attention to the authors’ names. Odds are you’ll find a common thread and what you like to read and can find more articles from the same source over time. Find key, online resources: There are a few key websites that cover triathlon 24-7, these are good places to start as well. I don’t recommend buying a book as most of those are quickly outdated…and are ultimately more complex than the bite-size information that you probably need (and are actually able to absorb). Watch and Learn: Head over to YouTube or simply search for videos on triathlon. There are plenty of great examples of things to do – and not to do! – When it comes to triathlon. You can find videos on swim technique, cycling skills, running technique, and more. If you’re looking for a good laugh there are probably some great “triathlon fail” videos out there of people making mistakes. You will learn a great deal by watching the folks that you train with, which you can continue that learning curve online using your computer. Tune into Triathlon: There are many many triathlon podcasts available now thanks to a growing market and portable technology. Get on your phone and find a few of the podcasts you’re interested in so you continue to learn. Podcasts are great because you can listen to them while you’re doing something else. You can listen to them in the car, when you’re commuting, even when you’re running. These are nice ways of complementing experience and don’t actually take away from the other things you are doing in the moment. Plus, there are some great interviews as well as plenty of of stories and anecdotes to make you laugh. Tip Number Five: If It’s Not Fun, Why Do It? At the end of the day, triathlon is meant to be a hobby. The minute it feels like a job, the less likely you are to want to do it. This is partly while having a training group is an excellent means of getting faster because it’s fun, you want to go, and they will challenge you. But starting to put yourself in a silo, or putting external pressures on yourself to perform…odds are you are going to ruin your fledgling triathlon experience. You can keep triathlon fun by picking lots of other races you can do along the way. Any local 5K or 10K run will do. The first charity bike ride in your town, go sign up for it. You are a triathlete, you can do it! While open water swim events are hard to find, if you’re fortunate enough to live near a good body of water, chances are there are some some groups who will be better and you can join. Take on new experiences. Search for new running routes or cycling. Get outside of your comfort zone and use triathlon as a means to explore, not only your fitness and potential, but your neighborhood too. It’s important to keep triathlon fun because the longer you play the game, the better you get at the game. We hope you enjoyed these five basic ideas for how you can improve your triathlon training for fun — and maximum results. But as athletes move down the spectrum of experience, they begin to look for other ways to get faster, stronger, and better. Here are a few bonus tips for those of you looking to go the extra mile. Inside Endurance Nation we use a fixed training schedule so that every week you know that your Thursday workout is an hour. We make every Thursday — each week — incrementally harder by changing the intensity of the main set so you are doing more work. So instead of having a 60-minute workout this week, a 70-minute workout next week, and an 80-minute workout the following week – you always train for an hour. Not only can you create a positive training stimulus, you are doing so without adding extra time which might interfere with your basic life or sleep patterns. If you have a bike and run workout – commonly known as a “brick” workout for the way your legs feel when you try to run — try to put them together. Any time that we can combine two workouts into one training session is more efficient for your schedule. Nowadays with electronic trading gadgets and online logs, you have very little to no excuse for not tracking your workouts. However, it doesn’t have to just be the data. For example, you can talk about how you feel or what sessions you enjoy that week. However you choose to record it, I encourage you to do it. Often times being able to go back and look at your training is a great way to discover how you ended up injured. Or how you got sick. Or, what worked last time you went so fast. But without the personal history, you will never know and overall improvement will suffer. Endurance Nation has a compilation of articles, podcasts, and videos designed to help triathletes regardless of the specific area that they are interested in. We’ve created several key pages on our website where we have aggregated this information to help make your life easier. If you are interested in learning more about any of the topics covered here, feel free to visit us online: www.endurancenation.us. As the online home of a triathlon, Endurance Nation is here to help you improve and tackle your next endurance challenge. Come on over to browse our website, and see if we can help you out. Interested in getting a 30 day, free trial of Endurance Nation to take it out for a “test ride” befor you make any obligations? About the Author: Endurance Nation founder Patrick McCrann is a 22-time IRONMAN finisher with seven trips to Hawaii. He lives in Rhode Island with his family where he enjoys trying to fit the swim, the bike and the run in between all of the soccer practices, dance recitals, and after school activities that make life fun. The holidays are past and it’s a new year full of new potential. Most athletes will start January looking for new ways to focus their workouts and improve performance from the prior year. While it still may be officially termed the “off season,” we are allowing both mind and body to recover from last year’s training stresses and getting caught up on those household and family things that we put on the back burner during major training blocks. Now is the perfect time to look into some of the best habits and products that will prepare you for your upcoming season and take you to the next level of racing that you aspire to. Whether it’s to increase from sprints to Olympic distances, race your first IRONMAN, or get a shot at Kona, here are six tools that will help unlock your 2016 racing potential. Another often overlooked aspect of training is the mental toughness that it takes to complete at any level, but especially as you advance in your goals and aspirations. Just how does an athlete begin to address what goes on in your head when you are training and racing? Does it happen to the Pros too? There are lots of articles, opinions, and books available on the subject. One of the best that I have read is How Bad Do You Want It, by Matt Fitzgerald. Would you believe that by bracing yourself for a tough race or training session that you can actually boost your performance by 15% or more? Or that your attitude in daily life is the same that you bring to sports? Or that choking may be a form of self consciousness? Have you ever wondered why you can always “kill it” in training, but don’t feel like you race up to your potential? Matt does an excellent job relating the ups and downs of many Pros and how they either were or were not able to conquer what went on in their heads. This is a must read for anyone who wants to up their game and gain insight into just how much of a role our mind can play in our success. You can train physically as much and as hard as you want, but if you don’t realize the role that your mind plays and take equal time to work on that aspect, you will never arrive at your true potential. This is 240 pages that you won’t put down and will want to re-read as your training and racing improves and your mental successes reach new heights. All the training in the world won’t make up for a bad race day nutrition plan. It has happened to everyone sooner or later. All that training and the big race comes and all of a sudden whatever you have been training on fails you miserably on race day and you end up with the dreaded GI issues. Now is the time to set some longer sessions where you can simulate your race day needs and start to practice your nutrition plan. R&D on the nutrition spectrum has increased dramatically over the last few years resulting in many new products. Whether you are basing your training and racing nutritional needs on calories per hour or carbohydrates, the more you practice dialing it in for race day the more successful you will be. Glukos Energy Nutrition is a new company that uses only all natural ingredients and contains glucose – the good sugar. Glucose is the body’s fastest, most efficient energy source. Glukos requires no digestion and is immediately absorbed, giving you 2X the energy, 2X faster. No matter what your sport or activity, power-packed Energy Tablets from Glukos nutrition will help you do it way better. Tailwind Nutrition is another fairly new product on the market. Developed specifically for the endurance community, Tailwind’s glucose/sucrose fuel takes advantage of how our bodies absorb nutrients. The combination of Tailwind’s fuel, electrolytes, and water has a synergistic effect, allowing the body to absorb more of each. Once in the bloodstream, the glucose in Tailwind fuels muscles directly, allowing athletes to go longer at higher intensities. It’s easy on the gut, gluten-free, and made from all natural ingredients. If you raced an IRONMAN or IRONMAN 70.3 last year, you undoubtedly had the opportunity to see BASE Electrolyte Salt on the race course. Now is the opportunity to try their Amino and Hydro products. BASE Performance founder and Pro Triathlete, Chris Lieto, knows how important it is to keep healthy and strong throughout the year. After years of learning, trial and errors, mistakes and triumphs, he has found a nutrition solution that includes the BASE Performance products. BASE has developed a unique and simple system with a variety of products for endurance athletes to improve performance, gain lean muscle, increase endurance, and enhance recovery. It has been tested and proven on the race course in Kona, as well as IRONMAN events across North America. Now is the time to practice your nutrition and hydration strategy and try some of the new product offerings to find which products will lead you to an improved performance for 2016. With all the technical gear on the market, an athlete is faced with an unlimited array of equipment and clothing to choose from. With your billfold being your only potential limiter on what you decide to purchase, where do you even start? If you want to increase your racing potential this year, start at the beginning, get a professional bike fit, or if you have already had one, get it updated. As an athlete trains and races throughout the year, you gain fitness, strength, and flexibility. This means that you are “not the same athlete” at the end of a race year as you were at the onset. Will you be racing different distances this year than last? Are you fitter and more flexible that last January? Regardless of your goals and fitness, spending the time and relatively few dollars that a professional bike fit takes will be well worth it. Along with “aero,” there is a “comfort” factor that has to be taken into account and it becomes exponentially more important as your training time increases in accordance to your race distance. You can be much more aero if you are racing sprints or Olympics, due to the length of time that your body is required to be in this position. As you increase to full-IRONMAN distances, you may find that your position no longer lends itself to five to seven hour training sessions. There are several recognized and certified bike fit programs. TriSports.com offers Retul Fit, which is one of the best. Check with your local bike shop to see what they offer or check out our Fly and Fit offer. The first year that I qualified for Kona, my coach told me he had one requirement, I needed to start training with power. Prior to this, I had always trained by heart rate. While the prior four suggestions to increase your 2016 potential are what I would call on the “soft side” of racing, meaning that in most cases you cannot accumulate hard data to track or verify your metrics/results, training with power is the opposite. This data provides the athlete with a hard, trackable metric that will tell you that you either are improving or not. There is no “perceived effort,” the numbers are what they are. Power meters have advanced over the years and now provide the option to show the power generated in each leg. Training with power can keep you from completely burning yourself out in the first 40 miles of the bike when you have 80 miles left to go. Power meters that show both left and right leg power can identify muscle weakness and imbalance and allow for improvement. PowerTap is one of the foremost leading companies in the world of power. Their pedals boast an accuracy rate of +/- 1.5%. The pedals are as easy to install initially as they are to swap between bikes, making them a very cost-effective solution for training and racing between a variety of bikes. The P1 Power Meter Pedal is dual-band Bluetooth Smart and ANT+ wireless connectivity and will work with any compatible cycling computer that measures power (watts). Now any standard pedal crank can be turned into a world-class power meter, giving you the detailed data you need to beat your personal best like never before. And this pedal-based system measures the power you’re generating in both legs! AAA batteries are easily replaceable. There are pros and cons to every method of measuring cycling power, so be sure and do your homework to see which is best for you. You will need to take into account cost and ease-of-use between different bikes, training and racing, as well as accuracy to determine what is right for you. While relatively new on the market, there are a variety of power meters that will track the power generated by your run cadence. Running with power is proclaimed to do for runners what cycling with power has done for cyclists. STRYD is one of the first devices that will allow runners to calculate power measured in watts. Created by Princeton engineers and backed by some of the biggest names in endurance sports, the STRYD device allows runners to accurately measure their intensity across any terrain. It easily syncs with Garmin and other leading watches and mobile devises. As with all data the key comes into interpreting the numbers. With run power, the goal of all data is the same, how to use it to become a more efficient runner, thus allowing you to run faster or farther at the same energy level. STYRD provides the opportunity to determine the relationship between run power, cadence, efficiency, and fatigue giving you a tool to improve your run for 2016 in ways never before possible. Visit Pam Kallio’s website to learn more about her coaching philosophy, www.trik2kalliokoaching.com. As triathletes, we tend to measure many things: how fast we went, how many calories we ate, how much we weigh. In a sport where you can measure just about anything and everything, there’s a good chance you are missing a critical piece to the puzzle if you aren’t measuring your power output on the bike. You can measure how far you’ve ridden, you can measure how fast you’ve ridden, you can measure the total amount of time you’ve ridden, but none of those measurements actually tell you what you really did, how much work you did. You subjectively know what you did, or how fast you did it, but you aren’t sure if it helped your fitness or really helped your fitness. The only sure way to know if what you did was effective, and how much so, is to use a power meter. This workout? Not so great compared to their previous best or to the previous 4 weeks average. Who is Training With Power? The top Pro Tour cycling teams all use power meters, most of the top triathletes use power meters and, with the wide availability of power meters on the market, many of your competition are using power meters. Training with power allows you to train objectively by measuring your output in watts. It allows you to measure your favorite route and know if the ride you just finished was a good ride or a bad ride. A power meter measures what you are doing when you ride. You know if the amount of effort you are putting out is sustainable for the long haul. There is no guessing; the power meter does not lie. How Can a Power Meter Help Me? 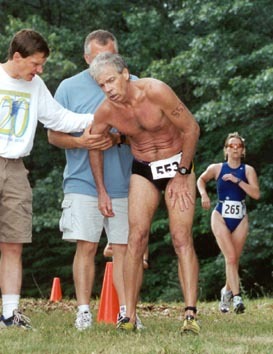 How many times have you been to a race and heard forlorn competitors lament post-race, “if only I had gone faster”? In every race, people underperform. These are mostly self-inflicted wounds. A frequent cause of underperformance is riding harder than you should, which negatively impacts your run. One way to prevent this is to use a power meter to target a certain wattage output – an output that assures that you aren’t riding your ability to run into the ground. By riding smart, you can finish without fading during the late stages of the run and ensure a strong, fast finish. A power meter also allows you to quantify your training. Maybe you used to ride your favorite route in 2 hours and now you ride it in 1:50:00. You are riding faster, so it has to be a better workout, right? Maybe, maybe not. With a power meter, you can download your rides into programs like WKO+, RaceDay Apollo or Golden Cheetah to keep a record of your riding history and analyze each ride, providing you solid and objective feedback. 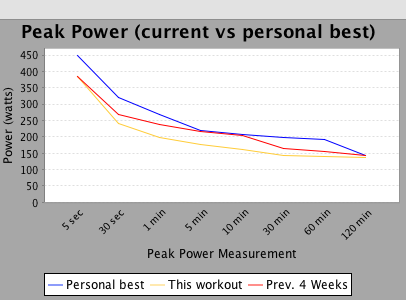 After you have established your functional threshold power, or FTP (around the maximal amount of power you can hold for an hour), you are able to measure each ride against this level, knowing for certain if the route you rode today in 1:50:00 is more or less beneficial to your overall training goals than when you rode it in 2 hours three months ago. With this knowledge, you can now tailor your training so you get the biggest bang for your training buck and ultimately end up with faster race times. How do I measure my FTP? FTP can be determined by performing simple field-testing. Detailed testing protocol can be found on pages 42-48 in the book Training and Racing with a Power Meter, by Hunter Allen and Andrew Coggan, phD. When you use a power meter you can ride smart and avoid succumbing to the “if only I had…” regrets post-race. Below are two power charts from the Ironman World Championships in 2012. I’ve marked each person’s FTP, shown by the top dotted line in each chart. The second dotted line is their average power for the entire bike leg. The first person rode well above their FTP for long periods of time during the early part of the bike. On the trip home, you can see a trend of declining power. His early exuberance caught up with him, causing him to ride below his target time and run much slower than his average run times. The second rider had the discipline to allow people to ride past him early in the race. As he tackled the climbs to the turnaround, he increased his watts, whereas others began to fade, and he closed the gap. Riding back from the turnaround, he was able to raise his power again, distancing himself from the majority of his competitors who had simply gone too hard, too soon. He went on to wrap up the race with not only his fastest marathon ever, but also with an Ironman personal best time. In these 2 graphs, the yellow line represents the racer's power level throughout the day. The rider on the left rode smart, adhereing to his power plan and was able to complete the ride without dropping watts later in the race. The rider on the right rode much higher watts at the beginning stages of the race than he could sustain, causing him to tire, thus riding at lower power levels than average for the closing miles of the race. The rider on the left went on to run a PB marathon split, while the rider on the right struggled. Which Power Meter is Best For Me? Now that you are convinced that using a power meter is the only true way to quantify your bike training and can be used to enhance your performance, the question is: Which power meter do I purchase? There are three basic types of power meters, each with their advantages and disadvantages. No matter what system you decide is right for you, you will need a head unit to display your power while riding. Hub-Based Power Meter: CycleOps PowerTap is a hub-based system, housing the power measuring mechanisms in the hub of your rear wheel. These systems come built into a selection of training and racing wheels, or you can purchase just the hub itself to be built into your compatible wheels. This is the easiest system to swap between multiple bikes, though unless you want to race on your training wheel or train on your racing wheel, you’ll need to purchase separate wheels (but really, can you ever have too many wheels?). Crank-Based: SRAM Quarq Power is a crank-based system, meaning it takes its measurements from points on the spider arms of your crank assembly. The system is easy to install once you are familiar with the process of crank installation. If you have more than one bike, you will need to purchase 2 systems or swap your cranks out each time you switch bikes. Pedal-Based: The newest players in the power meter game are pedal-based systems like the Garmin Vector Power Meter, taking measurements from the spindles of your pedals. This system is fairly easy to swap between bikes but requires you to use a torque wrench with an adaptor when you install it. If you install them incorrectly or do not torque to spec you will get incorrect readings. So you’ve smartly chosen to start training and racing with power. Congratulations! Now what? The most common question I get is “how do I get started?” Step one: go ride. Ride with your power meter over a few of your favorite routes, look at the number of watts you are putting out and think about how it feels. Allow yourself to just ride for a few weeks to collect data. Download it, look at it, but don’t change your training–yet. During this data collection period, pick up the book Training and Racing with a Power Meter by Hunter Allen and Andy Coggan, PhD. This is the gold standard for books on utilizing power to drive your training and racing decisions. It can be a little intimidating at first but provides the most in-depth primer on using your power meter to make the training and racing decisions that will help you reach your goals. Training and Racing With a Power Meter is an excellent resource for learning how to make the most of your power meter. Training with power is not a new phenomenon. I began training, racing and coaching my athletes with the use of a power meter in 2005. The improvements in technology, combined with demand and marketplace competition have brought prices down in recent years, making this invaluable tool readily available. If you are serious about getting the most out of your training and racing to your full potential on race day, picking up a power meter will be the best early season purchase you can make. About Brian Stover and Accelerate 3 Coaching: Brian is a triathlon coach who started his coaching career by taking a position as an assistant coach at a year round swim program in NC in 1994. That experience hooked him on coaching and now, almost 20 years later, he coaches triathletes, duathletes, cyclists, runners and other endurance athletes around the world. In this time, he has coached everyone from cyclists, mountain bikers, triathletes crossing the finish line for the first time, World Champion age group triathletes and professional triathletes. His athletes have won races or their age groups in local triathlons, 70.3′s and Ironman’s around the world. Learn more at www.accelerate3.com. X-Lab is the dominant brand in the rear-mount hydration/accessory carrier category, in part due to the ability to work on every saddle type, including the popular ISM Adamos. As ultra distance triathlons grow and bikes become more aerodynamic the need to carry bottles and spares has evolved. Early Ironman athletes were installing bottle cages behind their saddles to carry extra fluids on the Queen K in the 1980’s before the hydration category existed. Now the rear mount hydration system is its own category, largely dominated by one company, Craig Turner’s X-Lab. The rear mount hydration system seems to make sense from an aerodynamic perspective since the bottles ride in the lee or vortex of the rider. While aerodynamics are not that simple and the trend in hydration seems to be toward bike frame integration with Cervelo’s P4 and the new Treks, carrying bottles behind your saddle gives you additional options for carrying fluids, spares and tools. At the Bud Light Ironman World Championships in Kona, Hawaii in 1986 I improvised a rear mount saddle carrier based on a version used by Scott Tinley. 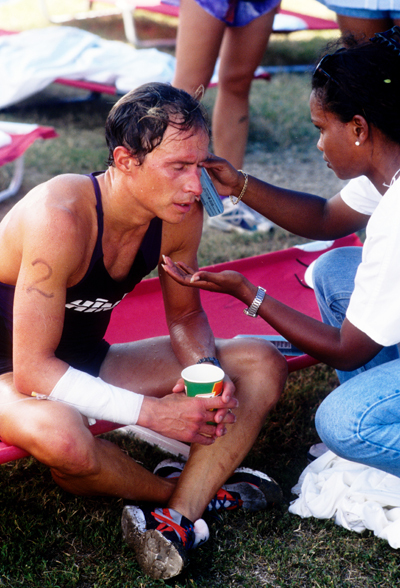 Ultra distance athletes have always been challenged with the best way to carry fluids and spares on the bike. The evolution of these systems is the result. The primary disadvantage to rear mount hydration systems, with the exception of hose fed systems not included in this survey, is you have to reach behind you and remove- then replace, the bottle without being able to see it. This takes practice. 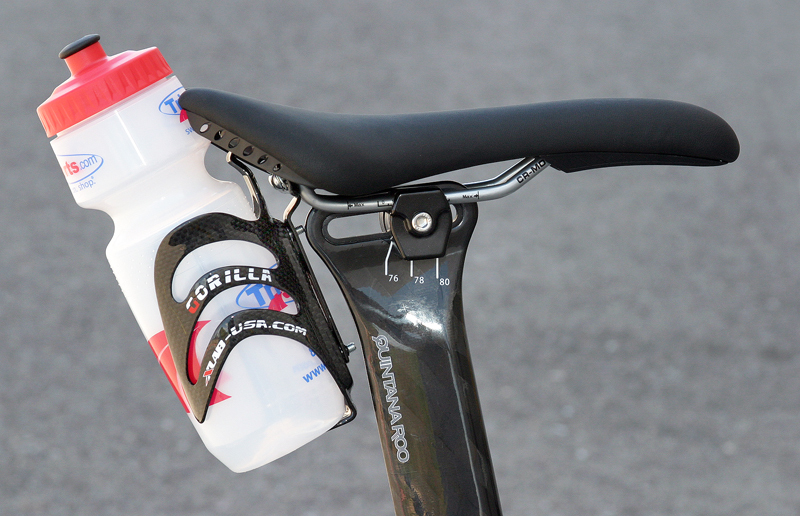 Most riders leave the aero position and sit upright on their base bars to access their rear mounted bottles. Experienced riders grab and replace bottles smoothly from the aero position. Not all systems and bottle cages retain large bottles well. In fact, most do not. Rear mount systems have earned a bad reputation as “bottle launchers”. The truth is, when a rear mount system does lose a bottle, it is usually because it wasn’t installed or configured correctly, or both. If you choose a good system, like most X-Lab systems, and use them with rear-specific cages like X-Lab’s Gorilla cage, these systems hold bottles securely. Some athletes leave the aero position to reach for their rear-mounted bottles (left) while others can use a rear mounted hydration system from the aero posture (right). Rear mounted hydration carriers are subject to the shape of the saddle and seatpost you use. Not all systems work with popular triathlon saddles like ISM Adamo or bikes like Cervelo. It’s important to know what equipment you have and what hydration system will mount to it. Most systems require some patience with installation since threading a bolt into a small nut under a bike saddle around a saddle rail is a tight and awkward process. Give yourself plenty of time and read all instructions before mounting a rear hydration rig on your bike. This is not a project for the night before a big race. These systems take time to mount and time to get accustomed to using. Use a torque wrench and be particular about torque settings. All of the X-Lab systems are superbly engineered to aircraft standards and fit the widest range of saddles with the most secure accesory and bottle retention. X-Lab systems lead this category. X-Lab: The Masters of Saddle Mounted Hydration. X-Lab is not the first rear mount hydration system, but they are the best. Founded by aerospace engineer Craig Turner, X-Lab is a niche company that proves if you do one thing better than anyone, you’ll dominate the category. X-Lab’s engineering approach to saddle hydration mimics other industry leaders like Cervelo with their constant testing, refinement and innovation. X-Lab’s technical support is also the industry standard, their website is a useful resource for finding the right configuration for your bike and event and for specific technical guidance on installation. Much of the X-Lab equipment is manufacturered in the U.S.
X-Lab makes so many rear-mount hydration systems we did not include them all here. A future review will survey the X-Lab systems individually. What is worth understanding about X-Lab is that their systems are the best fitting, most robust and most adaptive systems available. 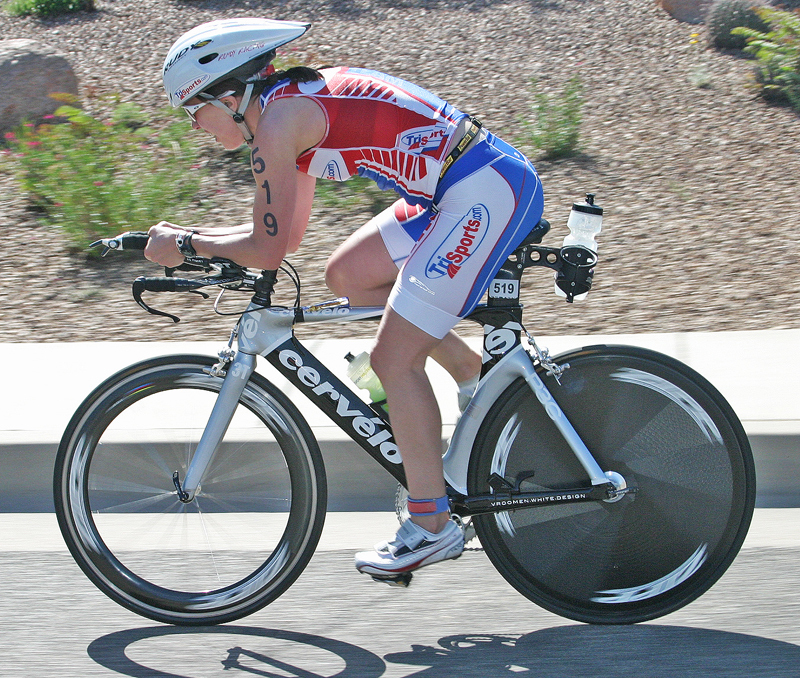 Too many Ironman champions use X-Lab systems to list, including Chrissie Wellington and Craig Alexander. Our Team TriSports athletes universally prefer X-Lab over the other brands we sell. Most of our sponsored athletes use X-Lab hydration systems, espcially for applications like this Cervelo P3. Technical details set X-Lab hydration systems apart and reveal Craig Turner’s aerospace engineering background. Every piece of X-Lab hardware is optimized and carefully chosen for its specific application. The mounting hardware is industry best. Turner’s X-Lab has made rear-mount hydration systems so long, and for so many bikes, they know what can go wrong and have designed around it. One examples is X-Lab’s fasteners. Triathletes can be lax with bike maintenance and checking torque specifications. X-Lab fasteners on key weight bearing areas include Nyloc nuts with a polymer insert to resist loosening from road vibration. Bolts are factory-coated with red Loctite that prevents loosening. The red Loctite treatment sets firmly 10 minutes after installation, and becomes semi-permanent after 24 hours of curing. Details make the difference in X-Lab systems: All X-Lab mounting hardware fits precisely when mounted. Bolts for X-Lab systems come pre-coated with anti-vibration thread locker. Polymer insert, anti-vibration “Nyloc” nuts further improve retention power and keep systems tight on your bike. X-Lab’s website provides excellent information of installation of their systems, with insight on tools, torque settings and specifications on various configurations of their modular systems which are adaptable over a wide range of race distances. 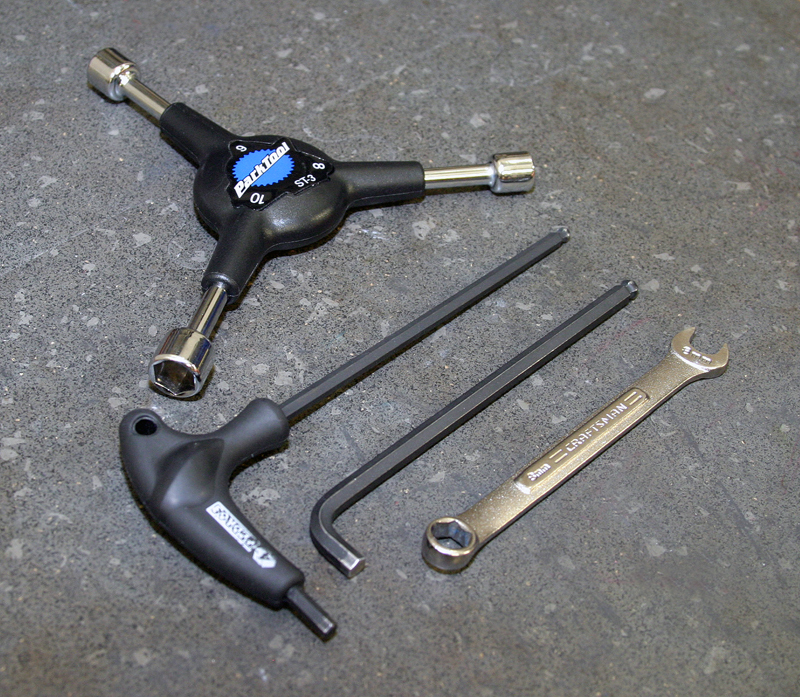 Basic tools needed to install a rear mount hydration system including X-Lab systems are the appropriate size metric hex (Allen) wrenches with a ball socket head for turning at angles in tight spaces, a torque wrench, open end wrenches and a metric nut driver in small metric nut sizes. The right tools are an absolute necessity when installing rear mount hydration systems since some mounting hardware is difficult to reach. Another advantage of X-Lab systems is their compatibility with unconventional saddle designs such as the popular ISM Adamo. 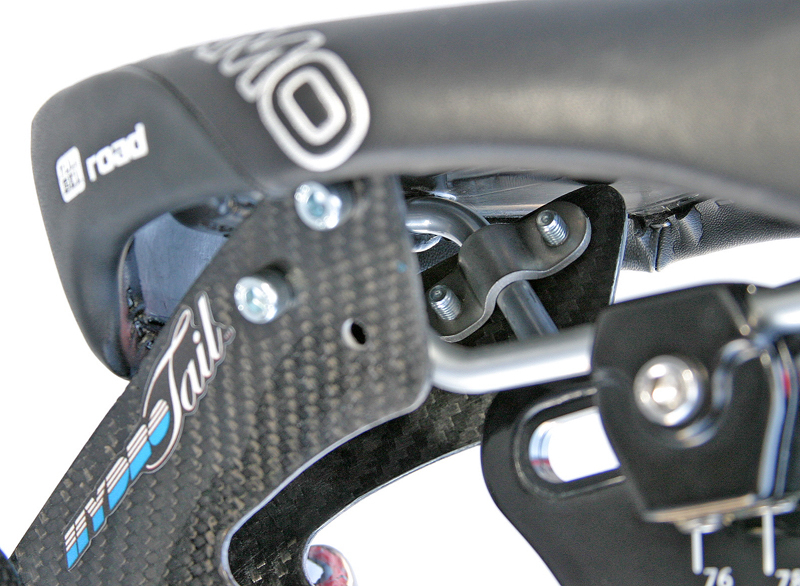 The long tails and transition hook on the back of ISM Adamo saddles mean X-Lab is the best fit on ISM Adamo saddles. Other saddles with unusual shapes such as the Fizik Arione family of saddles with its pointy rear protrusion and 30 cm length only work with X-Lab systems. X-Lab has even designed specific systems for proprietary bike designs like the deep aerodynamic shape of Cervelo seatposts. The fit and finish on these systems are superbly engineered and, once installed, stay very secure. The ISM Adamo saddles are among the best “problem solver” saddles for triathletes but present challenges for mounting rear hydration systems. 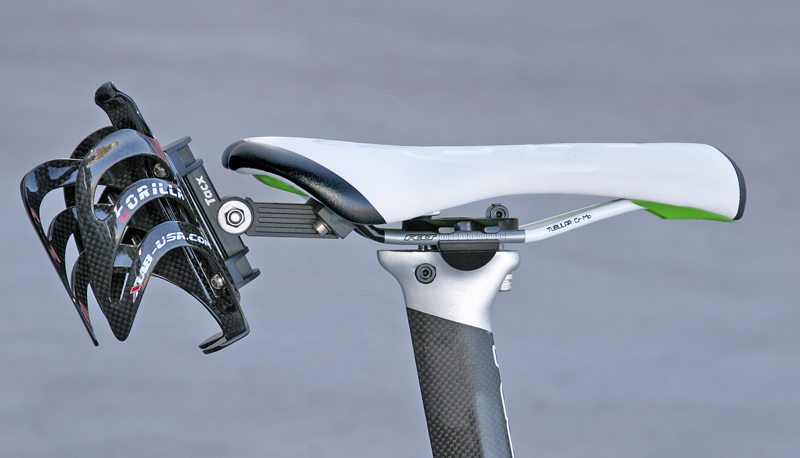 X-Lab systems fit precisely on ISM Adamo saddles and are extremely sturdy. The series of holes at the bottom of the X-Lab mount (right photo) provide angular adjustment of your bottle cages. 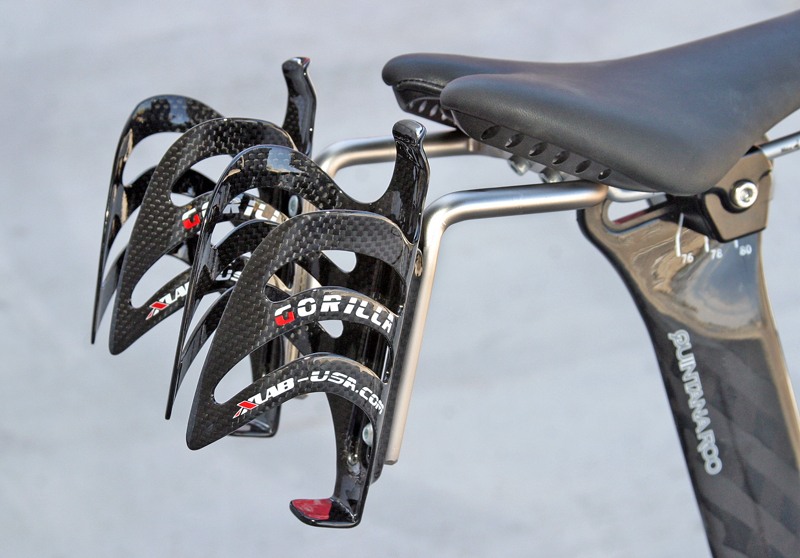 X-Lab also features an assortment of bottle cages including their rear mount specific Gorilla cage. The X-Lab Gorilla cage is the best choice for every brand of rear mount hydration system because of its excellent bottle retention. It’s almost impossible for a bottle to accidentally launch from an X-Lab Gorilla cage. X-Lab’s Cervelo Specific Sonic Wing integrates perfectly with Cervelo’s mounting holes on the P3, P2 and P4. Note: Since X-Lab has such a complete selection of rear-mount hydration systems we will do a complete, X-Lab specific review with ratings in an upcoming issue of TriSports University. The Profile RM1 is light, simple, easy to mount and relatively secure. It also works with ISM Adamo saddles. The Profile Design RM1 had growing pains but is now a greatly improved product. The system clamps to standard 7mm dimension saddle rails and will not work with some carbon fiber rails such as 7X9 carbon braided saddle rails on premium saddles including the Fizik Arione Carbon and Fizik Aliante Carbon. The reworking of the original version of this product includes a strong, adjustable locking pivot that provides angular adjustment of the bottle mount to the saddle clamp. Early versions were Polymer. New versions are cast alloy. Two nice CO2 threaded mounts accept your inflation cartridges and keep them ready. A spare tube or tire can be carried under the hydration system. The system holds two bottle cages and Profile includes its excellent polymer “Profile Design Kage” (also sold by X-Lab as the P-Cage) that holds bottles securely on rear hydration systems. A small elastomer band wraps around the Kages to help with bottle retention. If this band breaks, which is rare, bottle retention is compromised. Replacement bands are available from Profile. The Profile Design Kages do not scratch water bottles during removal or replacement. A nice touch to this system is a pair of threaded mounts to carry CO2 cylinders for flat repair. Be sure to use the small washers provided for the upper bottle cage mounting bolts when using the CO2 carriers so the Kages are bolted securely to the mount. If you don’t use the washers on the top bottle cage mounting bolts when mounting the CO2 carrier on the bottom mounts, the bottle cages are slightly bent on the carrier and don’t hold water bottles as well. A key to good performance with the Profile system is making sure the torque on the center bolt is high enough. As with most systems you need a torque wrench to properly install this system with relatively high torque, 6.7 Newton Meters (Nm, or 60 inch-pounds) to keep it from slipping. The system is clearly labeled with this specification. This system works well and provides reasonable bottle holding power. The design does require careful installation of cages at an optimal angle to resist losing bottles. Some oversized bottles may eject on very rough roads but normal use is secure and reliable. Given the right tools this system is easy to install and it does work with unconventional saddle designs such as ISM Adamo saddles like the one pictured in this review. Profile Design RM1: Tom Demerly’s Rating: “★★★★” 4 Stars of Five. Light and relatively secure, fits ISM Adamo saddles, may not be optimal with large bottles on rough roads. Minoura Single Cage Saddle Mount. Inexpensive and simple, the Minoura cage mount is elegant but does not work with many saddle types such as Fizik Arione and ISM Adamo. At well below $10 the Minoura Single Cage Saddle Mount is a bargain. It is a simple, all alloy mount that clamps to conventional saddle rails with two bolts and nuts. The system accommodates one conventional bottle cage and bolts are provided for mounting. This mount will not work with most unconventional saddle designs such as Fizik Arione, ISM Adamo, most Cobb Cycling models and many seemingly conventional road saddles. 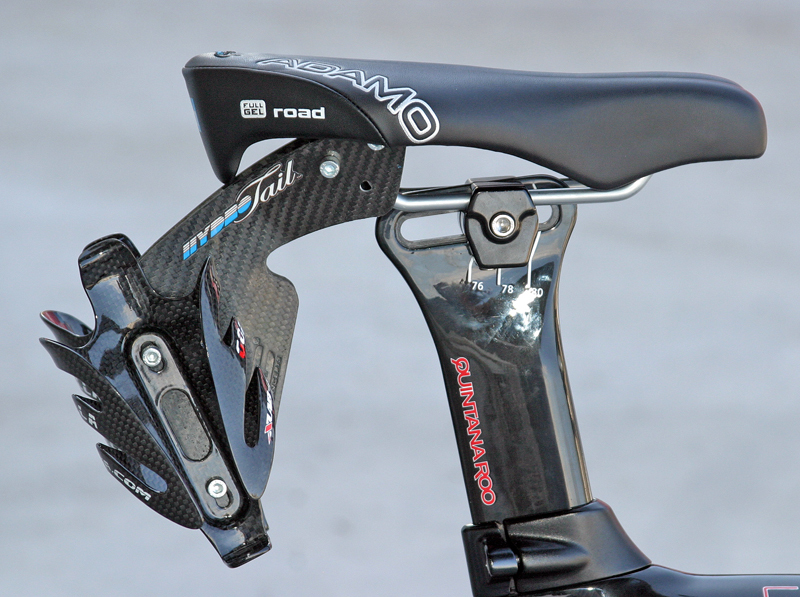 It also interferes with deep section aero seatposts on bikes like Cervelo and Quintana Roo (pictured). 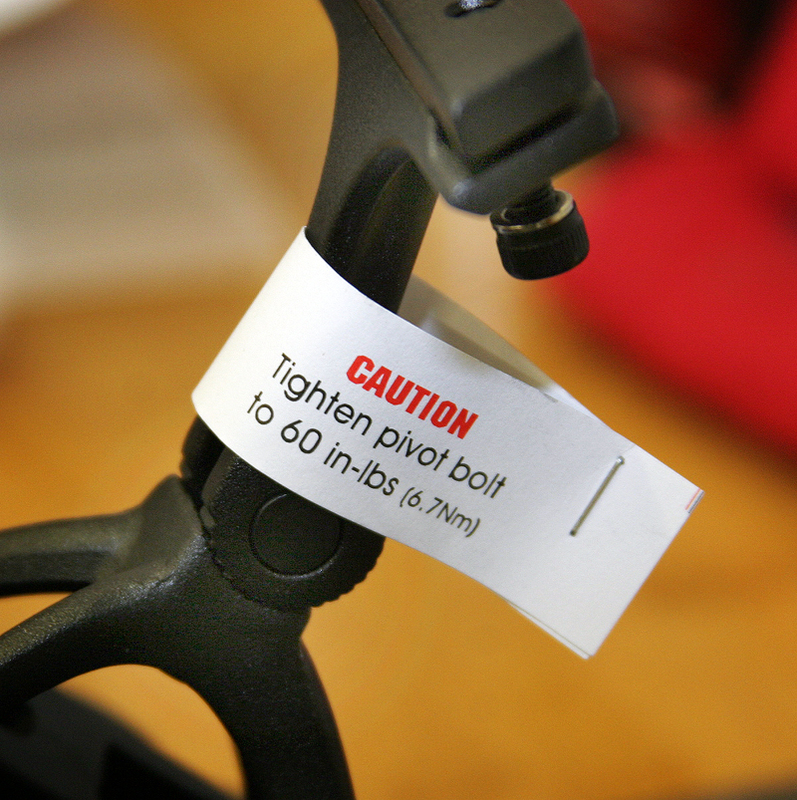 The mount is relatively malleable so you can bend it slightly but too much bending will weaken it. This may be one of the systems that gave rear mount hydration carriers a bad reputation since it seems to amplify road shock vibration over its length potentially launching bottles over a bump. A minimum of hardware means this is an easy installation, but you need to add Loctite to resiste loosening from vibration. The mount won’t work on ISM Adamo saddles since there isn’t space to get your bottles in the cage (right). Those things being limitations the mount is simple, cheap and is a good problem solver on smooth roads if you have the right saddle- but many triathletes don’t. Minoura Single Cage Saddle Mount: Tom Demerly’s Rating: “ ★” 1 Star of Five. Light and inexpensive but not very secure: Can eject bottles on bumps. Does not fit many popular triathlon saddles. Minoura Double Cage Saddle Mount. A simple, lightweight and inexpensive system, the Minoura Double Cage Mount is a proven design when used with good bottle cages like X-Lab’s Gorilla cages. .
More robust, versatile and refined than the single cage saddle mount from Minoura, I’ve used this double mount system on the rough chip/seal roads at Ironman New Zealand with success. 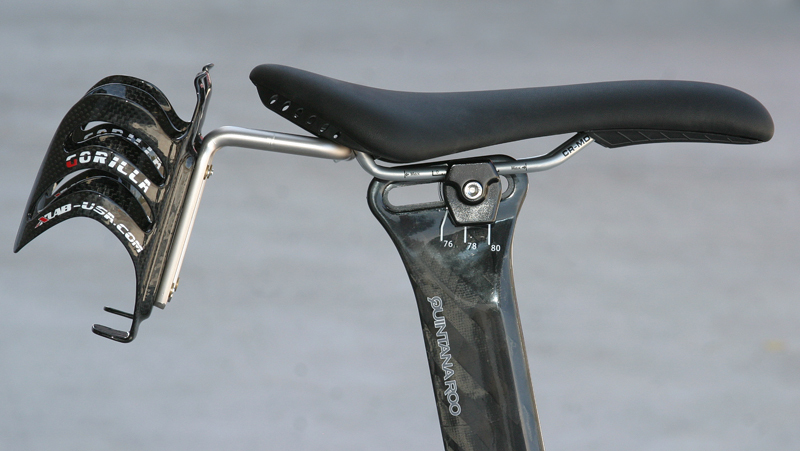 The system bolts to conventional saddle rails, but not the larger 7X9 carbon rails. I recommend the addition of red Loctite for a more secure installation of the mounting bolts under the saddle rails. Mine vibrated loose quickly without thread locking compound. Once coated with red Loctite, they stayed put. 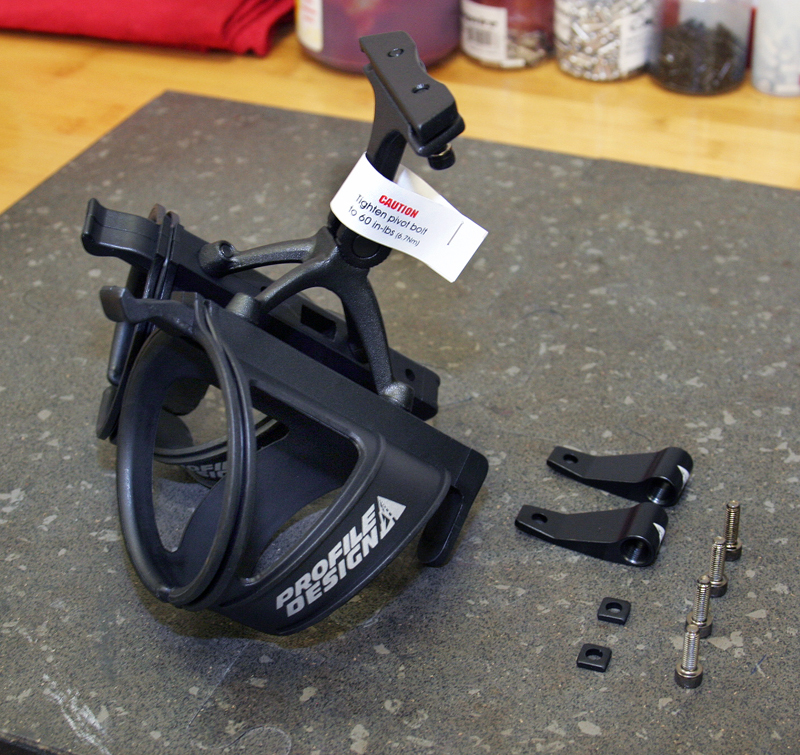 The simple mounting of the inexpensive Minoura double mount requires the addition of Loctite thread locking compound. The saddle rail clamp works with most metal rail saddles but won’t work with molded carbon fiber rail saddles. Because this mount is aluminum it can be bent slightly to an optimum angle giving it good fit versatility. I used mine on a 30 cm long Fizik Arione Tri saddle without problems or modification. Because the mount is effectively a lever that will vibrate on bumps be fussy about what bottle cages you use. I’d recommend X-Lab Gorilla Cages but I’ve used the Profile Kage with success. As with most rear mount hydration systems I recommend using X-Lab’s excellent Gorilla Cages for best grip to prevent launched bottles. This system is also inexpensive and very light weight which adds to its appeal. Installation is very simple. A hex/Allen wrench is supplied with the system. Minoura Double Cage Saddle Mount: Tom Demerly’s Rating: “ ★★★” 3 Stars of Five. Light and inexpensive. Relatively secure when installed with thread locking compound. Easy to install. Works with most saddles except some ISM Adamo saddles with long tails. Beaker Concepts Hydro Tail Carbon. Beaker Concepts makes several versions of their Hydro Tail including a Cervelo specific version. The Beaker Concepts Hydro Tail has been used by top pros and is a simple construction from a molded sheet of carbon fiber. Beaker Concepts also makes alloy versions and a Cervelo specific version that uses the two bolt holes on the back of a Cervelo aerodynamic seatpost such as the P4, P3 and P2. 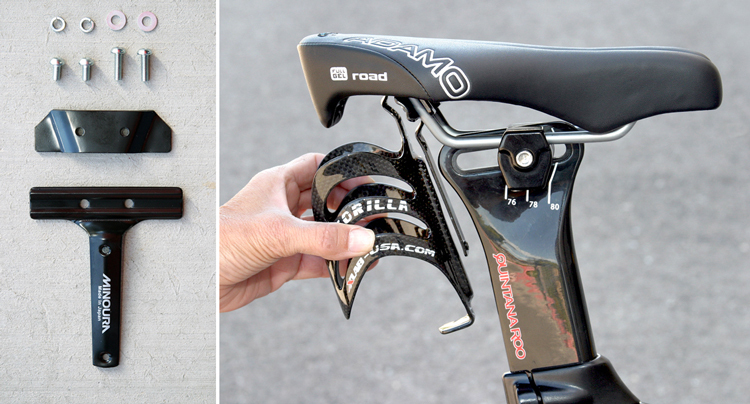 The system mounts well on most saddles and works on the ISM Adamo family of saddles. You do have to moderately stretch the bracket open enough for the width of saddle rails which makes installation a bit fumbly. The system is supplied with Nyloc anti-vibration nuts that are secure when tightened. Installation of the Beaker Concepts systems uses uniform bolt lengths for simplicity but is a little fumbly when threading mounting bolts into the Nyloc nuts inside the hydration wing. Needle nose pliers help with this. Mounting a cage to this carrier is tricky since there is little room inside the two sides to hold the nuts that the bottle cage bolts thread into. Use needle nose pliers, a multitool or even heavy forceps to hold the nuts inside the mount while threading in the bolts and start with the top bolts on each side for an easier installation. The mounting holes allow for some angular adjustment of the carrier (except on ISM Adamo, where you need to angle it downward) and stay relatively snug when installed with Loctite. Saddle clamps on the Beaker are threaded and do not need nuts making installation easier. The Wing unit will need to be slightly stretched open to fit the saddle rails. The entire family of Beaker Concepts Hydro Tails including the alloy versions are nice designs with few drawbacks that hold bottles and cages securely and provide a degree of angular adjustment. 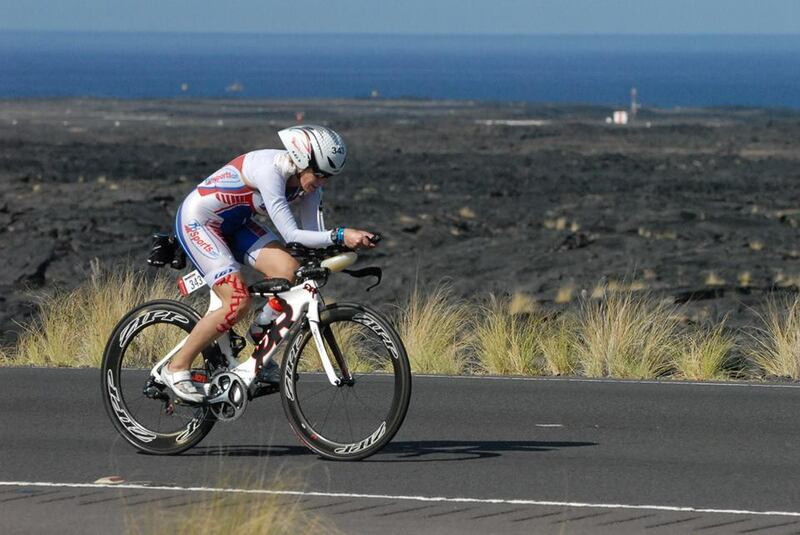 They are proven in Kona by athletes like Normann Stadler and have reasonable adjusment. Beaker Concepts Hydro Tail Carbon: Tom Demerly’s Rating: “ ★★★★” 4 Stars of Five. Lightweight and robust. Holds bottles very well when used with good cages. Some adjustment, works with most ISM Adamo saddles. 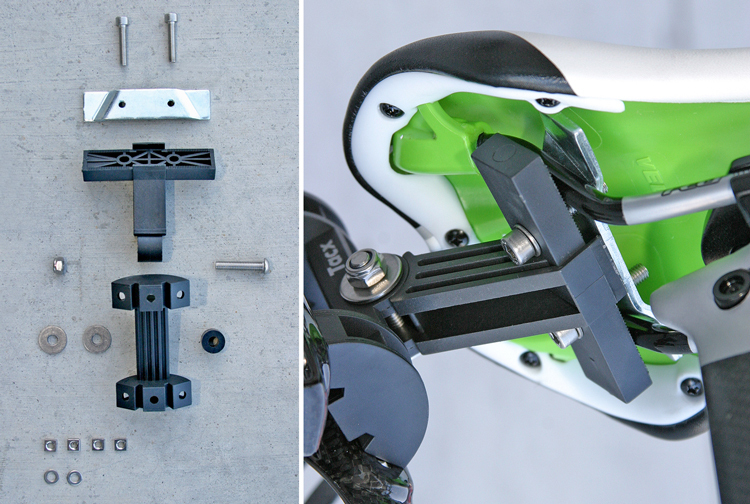 The Tacx Saddle Clamp is adjustable for angle but does not work with many saddles. Inexpensive and lightweight if a bit fumbly to install, the Tacx Saddle Clamp works with short-tailed saddles but is a no-go for Fizik Arione saddles and ISM Adamos. It holds two bottle cages grouped tightly together. There is an adjustment for the angle of the bottles and you need to get this right or you’ll be launching bottles on bumps. This is another system that benefits from the judicious use of Loctite thread locking compound. Assembly is a bit difficult when mounting cages but mounting it to a compatible saddle is not difficult. Finding a compatible saddle is. Since this system holds the bottle cages at the end of a small lever it tends to amplify vibration. Add to that the flexible polymer construction and this becomes a rear-launching anti-bike weapon if used with the wrong bottle cages. This little system needs a robust, tight cage such as X-Lab Gorilla cages, which undermines the thrifty price. Tacx Tao or Profile Kages work acceptably for small size bottles. If you grab an oversized bottle in an aid station and slide it in this system watch out for bumps. The system is inexpensive but rife with limitations. You’ll likely upgrade to an X-Lab system quickly. Tacx Saddle Clamp: Tom Demerly’s Rating: “ ★” 1 Star of Five. Lightweight but flexible. Good bottle cages are a must to prevent bottle launching. Some angular adjustment. Does not work on Fizik long tailed Arione and ISM Adamo saddles.